It is cempedak season again. Besides durian, this is another highly popular fruit in this part of the world. Pronounced "chem-pe-dak", which is the same genus as jackfruit. It is native to Southeast Asia. The thin and leathery skin of the fruit is greenish, yellowish to brownish in color, and patterned with hexagons. The fleshy, edible arils surround the large, seeds in a thick layer. 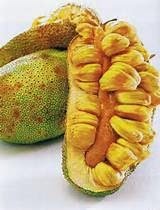 It is yellowish-white to orange in color, sweet and fragrant, soft, slippery and slimy on the tongue and a bit fibrous. The taste of the fruit is similar to the related jackfruit with a hint of durian. The seeds are flattened spheres or elongated, about 2–3 cm in length. I had excess cempedak after making ice cream with it, so I usually freeze it up. So I took on the challenge to make my own version of this Cempedak Crumble Tart. I believe you cannot find this in the shops. I am quite proud of myself for this creation. Give it a try if you have an itch to bake something and if you are running out of ideas on what to bake, like me. Do eat it up fast, these tarts cannot be kept for more than 3 days. Makes about 15 mini tarts using disposable aluminium mini foil cups. Put cempedak and sugar in the blender and purée, add a tiny tad of water if it helps in the blending. Put whipping cream in a stand mixing bowl and whip to become whipped cream. Use a spatula and mix the sweetened cempedak purée and whipped cream together until well mixed. Spoon it into a large piping bag and put it into the fridge to harden into piping consistency. Add icing sugar, almonds, salt, vanilla extract and egg and mix on low speed. Blend well after scraping the sides. Switch off the machine as soon as dough comes together. Do not over mix. Divide the dough into two portions. Roll each portion into a ball and wrap with food plastic wrap and chill in the fridge for at least 4 hours preferably. You can store the rest in the freezer if you are not using it. This can be stored for up to a month. Heat the oven to 180 C, when you are ready to make the tart, cut out a freezer bag or a big clean plastic bag, and put the dough in between to roll out. Cut according to size of the mini tart cups. Bake for 15 minutes at 180 C till golden brown for the small tarts. Leave some dough for the crumble, roughly take small pinches of dough and scatter on the baking tray, bake at 180 C for 5 to 7 min or until golden brown. set it aside to cool. Take the piping bag of cempedak fillings out of the fridge. as soon as it is of piping consisitency, we can fill the mini tart cups. Pipe the fillings into the tart cups in a spiral manner, ending it to a tip. put the prepared crumble all over the filling, making sure it sticks to the filling. There you go, enjoy!